Full disclosure: I was lucky enough to given two tickets to see Take That at Wembley Stadium with the Pet Shop Boys in support at the weekend by the kindest of souls, and though this is primarily a theatre-based blog, I thought I’d write up the show as I am heading up north to take in some of the Manchester International Festival, the highlight of which for me will be Björk’s Biophilia show, and so I’m getting in a little practice of writing about music shows. 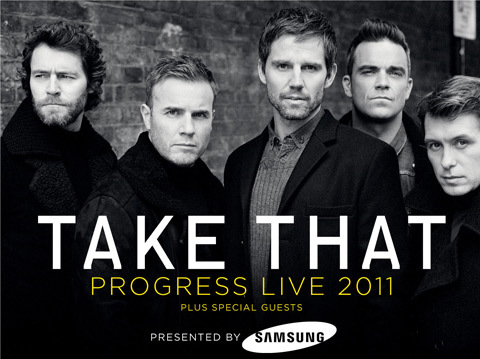 The Progress Live 2011 tour boasts the claim of being the fastest-selling tour in history, including an impressive 8 nights at Wembley, marking the band’s first live outings since Robbie Williams returned to the line-up. Booking the Pet Shop Boys as support was a canny move, fitting the demographic of the audience perfectly and providing an upbeat start to the evening. Presenting a trimmed-down version of 2009’s Pandemonium Tour with its Gilbert & George-style video projections and dancers with brightly coloured cubes on their head, Neil Tennant and Chris Lowe reminded the crowd just why they’ve been an enduring force on the British music scene for nearly 30 years. Newer songs like the sparkling Love Etc. fit in perfectly with the relative ‘oldies’ which were lapped up appreciatively by the crowd, epics like ‘It’s A Sin’, ‘West End Girls’ and a stirring rendition of ‘Go West’ resonating marvelously with all, but particularly children of the 80s like me. Reflecting the varied history of the band, the main show was split into three segments: opening was Take That as a four-piece, playing a short set of the songs that relaunched them into charts, Robbie was then granted a solo set before joining the others for a final programme of the tunes that made them famous, plus a healthy smattering of songs from their latest album Progress. Whether a prerequisite of Mr Williams’ participation or a free choice, it felt a curious decision that gave a very disjointed feel to the evening. I suppose I ought to mention that I was never a fan of Take That when younger, they were the band that my elder sister liked so I preferred East 17 to be different, though I have liked some of their newer material. But I have always really disliked Robbie Williams, just so you know! Starting with ‘Rule the World’ marked a high point for the opening sequence that was never really equaled: perhaps it was due to the mid-tempo-ness of much of the ‘man-band’ oeuvre that marked their return to prominence but Messrs Barlow, Donald, Orange and Owen exuded something of a bland smugness, bordering on arrogance in the case of Barlow that left me feeling quite uneasy. The natural charisma or showmanship that accompanies the truly great performers is lacking here, perhaps characterized by the baffling decision to have the audience sing along to the National Anthem, an utterly unneeded time-filler which served little purpose. A psychedelic Magic Roundabout staging for ‘Shine’ finally introduced some character as they departed leaving me despairing of what was to come. But despite, or perhaps because of, my low expectations, Robbie Williams actually did much more to entertain. Bouncing onto the stage from on high, his exuberance filled the cavernous venue effortlessly and there was no denying now easily he held the audience in the palm of his hand. The sense of unpredictability that accompanied his performance was a little too dangerous for my liking though, a bizarre sequence of snatches of cover versions again wasted time that could have been better utilized elsewhere, barely a sentence passed his lips without an f-word thrown in and the constant mugging and inability to convince at showing humility (as attempted in ‘Angels’) suggested how much of this was an ego-stroking opportunity for him. But he did it extremely well and I enjoyed myself much more than I thought I would. When reunited as a five-some though, the show finally gelled together: the combination of the old-school crowd-pleasers and the punchier numbers of the recent Stuart Price-produced album along with some great set-pieces: the waterfall of ‘The Flood’ and the chessboard of ‘Kidz’ being my favourites. Again though, my little reservations kept popping up, Robbie’s uncontrollable adlibs rearing their head too often and the po-faced seriousness of each band member periodically picking up an instrument to briefly prove their ‘muso’ credentials was laughable. This posing is a personal bugbear, especially when done by people who actually have musical talent, more than once Barlow sit behind the piano for a verse and chorus but then abandons it midway through: I just don’t see the point in it, if you’re going to play the piano and I love it when people do, then just do it properly, don’t pretend. The much-trailed giant robot looked good when stationary rather than during its lumbering, unfolding progress but came into its own with the singalong and dancealong to ‘Never Forget’, the highlight of the finale and what came across as an impressive show altogether. It’s hard to escape the feeling that something slightly artificial about the way in which the three segments are bolted together, almost like two extra support slots before the main show. But I don’t think this would unduly bother genuine fans of the band and it must be said that even this sceptic was close to being won over by the end, even if nothing came close to ‘Go West’ for me.